There are number of microbial agents which inhabit a dog's skin and hair. Once the colonies of such bacteria exceed the normal amount, the bacteria may cause a severe skin infection. Various species of bacteria such as Staphylococcus, Streptococci, Micrococcus, Actinobacter, Bacillus, Pseudomonas and many more are such examples. Some of them are obligatory (common) and some are transient (temporary) residents of dog skin. Bacterial populations are more common at two different points. Moist, warm and sensitive areas like that of mouth, lips, inguinal region (groin) and those pressure points, where the chance of rubbed, bruised and ruptured skin is seen like that of the elbows, toes, tail & ventral side (belly) of the abdomen. Skin infections in dogs can be categorized as being superficial or deep in the skin. The deeper the infection, the more complications and in turn, they take a longer time to recover. Superficial signs appear as scaling of the skin, topical alopecia (hair loss), inflammation, redness, papular eruptions (small solid eruption of the skin that does not contain puss), crusts, and severe pyoderma (puss). 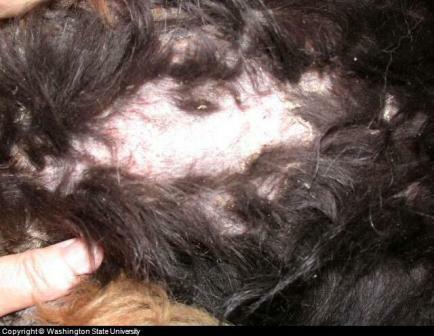 In dogs with short hairs, the hair will look hard and the hair follicles will appear to be ruptured. Severe itching and scaling causes dogs to scratch their skin which results in abscess formation (area of puss), which is more complicated and involves deep tissues as well. 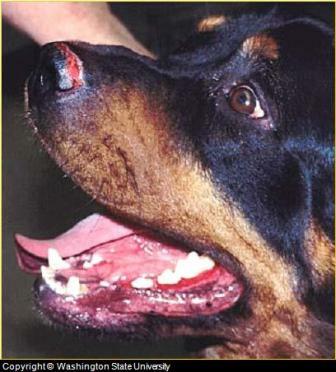 Deep pyoderma (puss filled ulcer), another form of dog skin infection causes severe pain, pruritus (severe itch), bad odor and hemorrhagic lumps (bloody) on the skin. Pus containing blood exudates (fluid) flows out of the infection site more frequently & dog tries to lick these secretions. Deep skin infections are more frequent at the muzzle, elbows, neck, inter digital areas, hocks (ankle joint) and around the inguinal (groin)region. Generalized skin infections may also cause fever, tiredness, ataxia (lack of muscle coordination) and loss of appetite. Usually clinical signs, history and a physical examination will reveal a superficial skin infection, but a deep skin problem can only be diagnosed by careful laboratory examination and approaches which help a veterinarian choose between different possible causes. Dog skin infections should be differentiated from mange, dermatophytosis, flea infestation, hair loss due to hypothyroidism and cancerous growths. Parasitic infestations can be diagnosed by examining deep skin scrapings. Confirmatory diagnostic tests are carried for not only determining the exact specie of bacteria causing the skin infection, but also helps in selecting the appropriate antibiotic for treatment. The application of different approaches to radiation such as X – Rays, Electrons & Gamma Rays are all common options to restrict cancerous cellular growth. In most cases radiation therapy has prove to be effective, but possess severe adverse side effects. Primarily, the use of an antibiotic therapy is preferred. General antibiotic therapy and topical application of antibiotics are two options to select from. Supportive supplementation by multi vitamins & minerals enhances the recovery rate. More then 21 days are usually required for complete antibiotic and recommended supportive care for complete recovery, while deep skin infections and severe pyoderma may take 7 – 8 weeks before it’s completely over. Lincomycin, clindamycin, sulfadiazine, cephalosporin & chloramphenicol are the most commonly used antibiotics. Topical application of antibiotics is only effective in superficial dog skin infections. An ointment containing 2% mupricin is considered very effective in dogs. It is usually recommended that ointment is applied to skin for at least twice a day until complete recovery. Supplementary options like those of multi vitamins, especially vitamin C and minerals can improve conditions, physiology and reduces recovery period. The use of a natural homeopathic remedy may also help. Extensive care should be taken to isolate affected dogs so that the chances of transmission to other dogs via contact can be reduced. Professionally grooming dogs with skin infections is highly preferable. 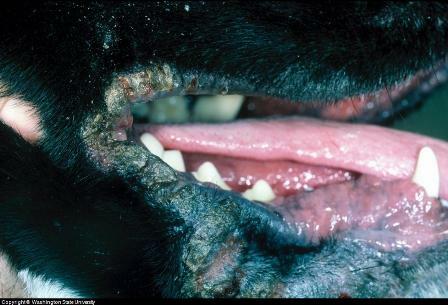 Dogs should not be allowed to lick affected areas and of course should be kept away from dirt. Affected dogs with superficial skin infections should be bathed 2 – 4 times a week during the first two weeks of treatment and then 1 – 2 times a week, until infections are resolved. Medicated shampoos should be diluted to 1:2 & 1:4 in water and should be lathered before applying. Shampoos containing benzoyl peroxide, chlorohexadine & triclosan are preferred. Shampooing will reduce the bacterial population, scales & crusts. thus improving chances of early recovery.